Affordability and luxury are combined in this sleek mesh chair. It has a host of great options, such as width-adjustable padded armrests and pneumatic height adjustment from 24" to 28" (61 cm to 71 cm). The 24" (61 cm) diameter steel-reinforced nylon base features hooded casters. The seat cushion is 18" wide × 18" deep × 3" thick (46 cm × 46 cm × 8 cm). The Salambro Jr. also features a vented 18" (46 cm) wide mesh backrest that rises 18" (46 cm) above the seat and features depth adjustment. 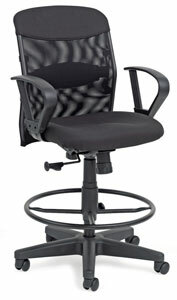 The padded lumbar support can be adjusted up and down for comfort.